The old Indian man slowly straightens up from his bowed position as his young grandson waits impatiently. It is the first time the boy has been allowed to accompany the older boys and men to the river, and he is eager to begin. But first they must bow to the washing stone. As their ancestors before them, they earn their meager living by washing clothes for the higher castes. They are Dhobis, one of India's Dalit communities, formerly known as "untouchables." Their diet is mostly vegetables and grains, with an occasional bit of meat. When a Dhobi girl marries, her dowry usually contains just a few items, but almost always an iron. After the men wash the customers' clothes, the women iron them and keep the money they earn to pay for household expenses. Mothers teach the girls to iron at an early age, and boys help their fathers by washing the smaller articles of clothing and by delivering packages of clean clothes to their owners. Most of the Dhobis follow popular Hinduism and worship local gods as well as the washing stones. The vast majority of these Dalits remain Hindu, but they have contact with other communities. * Pray that the Dhobi people will hear the gospel and discover that Jesus Christ can wash away their sins. 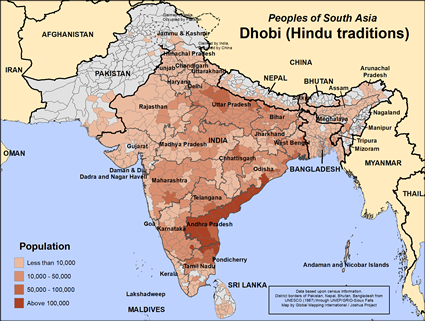 * Pray that believers will tactfully share gospel recordings and play Christian radio broadcasts for Dhobi Hindus. * Pray that the Holy Spirit will give faith to the Dhobis.View Dhobi (Hindu traditions) in all countries.